What will the Bay Area look like in 2040? This chapter provides an overview of the primary “inputs” to Plan Bay Area 2040: 24-year regional household, employment and transportation revenue forecasts. These forecasts form the basis of the proposed land use pattern and transportation investment strategy described in the next section, Strategies and Performance. The Professional/Managerial sector is expected to grow in the Bay Area by 2040. Growth of 1.3 million jobs between 2010 and 2040, with nearly half of those jobs — over 600,000 — already added between 2010 and 2015. An increase of over 2 million people between 2010 and 2040. Almost one-fourth of this projected growth occurred between 2010 and 2015. An increase of approximately 820,000 households. Only 13 percent of this growth occurred between 2010 and 2015, as household formation was held back in part by post-recession financial conditions and a lack of housing production. The pace of future household growth is expected to increase as the population ages and more working-aged adults enter the region. These 2040 projections, as shown in Table 3.1, represent a moderate increase over 2040 estimates from the original Plan Bay Area and incorporate the region’s strong growth since 2010. TABLE 3.1 Bay Area population, employment and household projections. For more information on Plan Bay Area 2040’s employment and household projections, please see the Regional Forecast of Jobs, Population and Housing. With an additional 1.3 million jobs in the Bay Area, increasing numbers of residents are expected to work in professional and service-sector jobs as well as in health and education. Construction jobs, which were still depressed in 2010, will also expand. Despite increases in output and demand in all sectors, employment is projected to decline in a few sectors due to higher productivity or relocation to lower-cost sites outside the region. Jobs in manufacturing and resource extraction industries, for example, have been declining for decades and are expected to continue decreasing. Table 3.2 illustrates select employment sectors that are expected to either grow or decline by 2040. Employment growth in the region is expected to slightly outpace the nation, with the Bay Area’s share of total U.S. employment continuing to grow. TABLE 3.2 Job growth trends in select Bay Area employment sectors by 2040. The Bay Area is projected to see strong employment growth in sectors such as construction, health and education, and professional and managerial services. Manufacturing and resource extraction industries are expected to continue declining, as they have for decades. With an additional 2 million people, the Bay Area’s residents in 2040 will be older and more diverse. The number of school-aged children (5 to 17 years old) will decline in relative terms, while the number of people 65 and over will account for more than half of all population growth in the region. This segment of the population will grow to account for approximately 22 percent of the population by 2040, an increase from roughly 12 percent in 2010. FIGURE 3.1 Bay Area population by age, 2010 and 2040. FIGURE 3.2 Bay Area population by race/ethnicity, 2010 and 2040. This segment of the population will grow to approximately 22 percent of the population by 2040, an increase from roughly 12 percent in 2010. By 2040, there will be no clear majority or plurality in terms of race/ethnicity in the Bay Area. As population groups, Whites, Hispanics and Asians/Other will each account for approximately one-third of the region’s population. Projections of household growth assume that household size will be constrained by costs and affected by a greater share of multigenerational households, plus more two-person senior households as the gap between male and female longevity narrows. In addition, barring action by policymakers, “in-commuting” by individuals – those who commute into the region from surrounding areas but might otherwise live closer to their jobs if they were able to find housing to suit their needs – could increase by as many as 53,000. In the following section, Plan Bay Area 2040 presents a development pattern to build enough housing within the region to accommodate the household growth associated with all demographic change and employment growth, including in- commuter households. Concurrently with jobs and household projections, Plan Bay Area 2040 estimates how much it will cost to operate and maintain the existing transportation system over the next 24 years, as well as the amount of revenues reasonably expected over that time period. What are the costs to provide existing transit service every year through 2040? What are the costs of maintaining the existing transportation infrastructure through 2040? How much money is available to pay for these two components? Answering these questions, as well as identifying the locations of future housing and job centers, is important for determining where to spend the Bay Area’s transportation resources. MTC worked with local jurisdictions, transit operators and the California Department of Transportation (Caltrans) to develop cost estimates for operating and maintaining the Bay Area’s transit system, local street and road network, the state highway system, and local and regional bridges. The costs to operate and maintain the highway system also include a growing need to maintain the hardware required for traffic management projects like ramp meters and dynamic signs. As shown in the table below, to reach a state of good repair – meaning that roads are maintained at their optimum levels, transit assets are replaced at the end of their useful lives and existing service levels for public transit are maintained – the Bay Area will need to spend an estimated total of $254 billion over the next 24 years. TABLE 3.3 Costs to operate and maintain the existing transportation system. For more information on Plan Bay Area 2040’s needs assessment for transit and roads, please see the Transit Operating and Capital Needs and Revenue Assessment and the Local Streets and Roads, Bridges and State Highway Needs Assessment. MTC also worked with partner agencies to determine funding needs for projects that would expand capacity and increase system efficiency beyond operating and maintaining the existing system. In the Call for Projects for Plan Bay Area 2040, transit agencies requested almost $200 billion for transportation projects. Combined with the funding required to provide existing transit service and improve asset conditions, identified transportation needs and project requests for the region between now and 2040 totaled nearly half a trillion dollars. 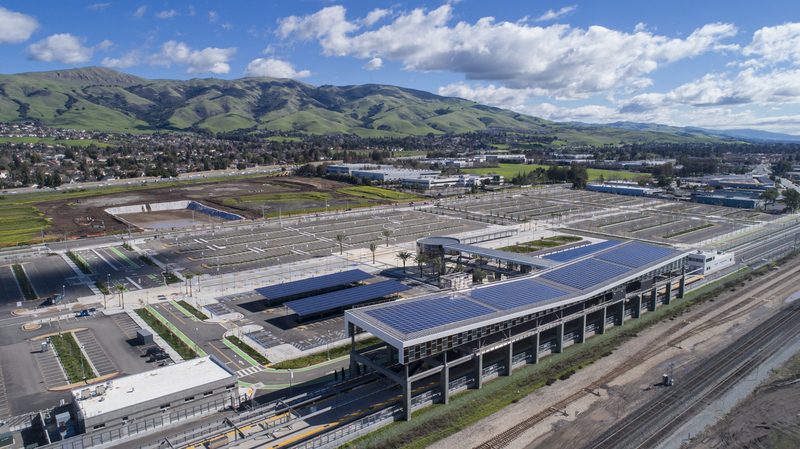 The new Warm Springs BART station opened in spring of 2017, bringing rapid transit closer to job growth in the South Bay. Like other metropolitan regions, the Bay Area receives transportation funding from a vast array of federal, state, regional and local sources. As shown in Figure 3.3, the total 24-year forecast of expected transportation revenue for Plan Bay Area 2040 is $303 billion, estimated in year-of-expenditure dollars. FIGURE 3.3 Forecasted transportation revenues for Plan Bay Area 2040. What differentiates the Bay Area from many other regions is the significant share of local and regional funding — approximately two-thirds of forecasted revenues are from regional and local sources such as transit fares, dedicated sales tax programs and bridge tolls. Making up the remainder of revenue sources are state and federal revenues (mainly derived from fuel taxes) and anticipated revenues (unspecified revenues from various sources that can reasonably be expected to become available within the plan horizon). For more information on Plan Bay Area 2040’s financial assumptions, please see the Financial Assumptions Report. Only a modest share of the $303 billion in transportation funding is flexible. The vast majority of funding is committed to specific purposes or projects because of the revenue source or voter-approved expenditure plans. Projects could also have prior funding commitments due to an ongoing project timeline. In determining funding assumptions for Plan Bay Area 2040, the Bay Area must first take stock of these existing and ongoing commitments. As shown in Table 3.4, half of the region’s existing commitments relate to operating and maintaining transit, with the majority of this funding comprised of locally generated transit fares and county sales taxes. TABLE 3.4 Committed revenues by function for Plan Bay Area 2040. The remaining committed funds are directed to operate and maintain roads or are committed to specific projects (such as those under construction today). The remaining revenues are considered “discretionary,” meaning they can be flexibly applied to various transportation purposes within the constraints of the funding source. Discretionary funds are important not only because of their flexibility, but also because they reflect future revenues the region can leverage to influence policy and implementation. These future discretionary revenues total $74 billion, approximately 24 percent of the total projected Plan Bay Area 2040 revenues, as shown in Table 3.5. TABLE 3.5 Discretionary funding sources for Plan Bay Area 2040. The next section, Strategies and Performance, will explain the forecasted development pattern of household and employment growth, and how transportation funding resources will be invested to support it. 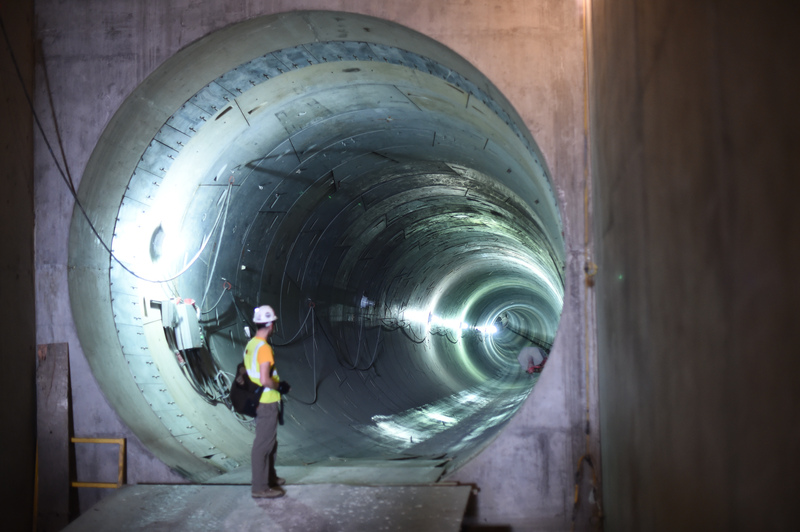 Construction is currently underway on San Francisco’s Central Subway Project.